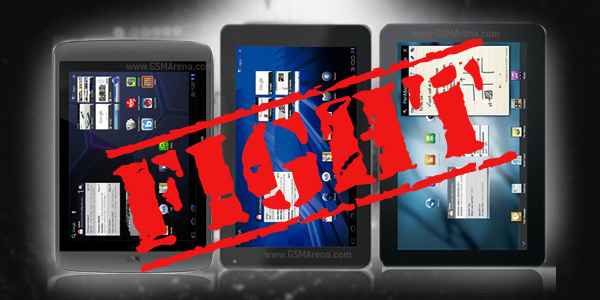 So we pitted the freshly announced 8-inch Archos 80 G9 against the 3D-shooting 8.9-inch LG Optimus Pad and the slim Samsung Galaxy Tab 8.9. The Archos 80 G9 has some interesting tricks up its sleeve like a 1.5GHz dual-core Cortex-A9 processor and an optional 250GB HDD. The LG Optimus Pad on the other hand can shoot 3D videos and the Samsung Galaxy Tab 8.9 boasts seriously good looks and a gorgeous screen. Okay, enough blabbing about, let the tablets’ specs do the talking. The Archos 80 G9 battery capacity remains a mystery, but it’s sure as a bright day that with the overclocked 1.5GHz Tegra 2 chip it won’t last as long as competitors with regular CPU clocks. Then again it might use its smaller screen to its advantage and somehow find a balance. We’ll update this table as soon as we get more information on the matter.